Let’s face it, producing quality content all the time can be tough, not to mention time consuming. That’s why you want to take your great content and use it in as many ways as possible to improve your small business marketing. It saves you time, gets you noticed on different platforms with different audiences, builds your credibility, sets you up as an expert, and ultimately gets you more exposure – which is exactly what you need to grow your small business. Now there are some pretty obvious ways to do that, but we want to be creative! So here’s 5 innovative ways to repurpose your content. 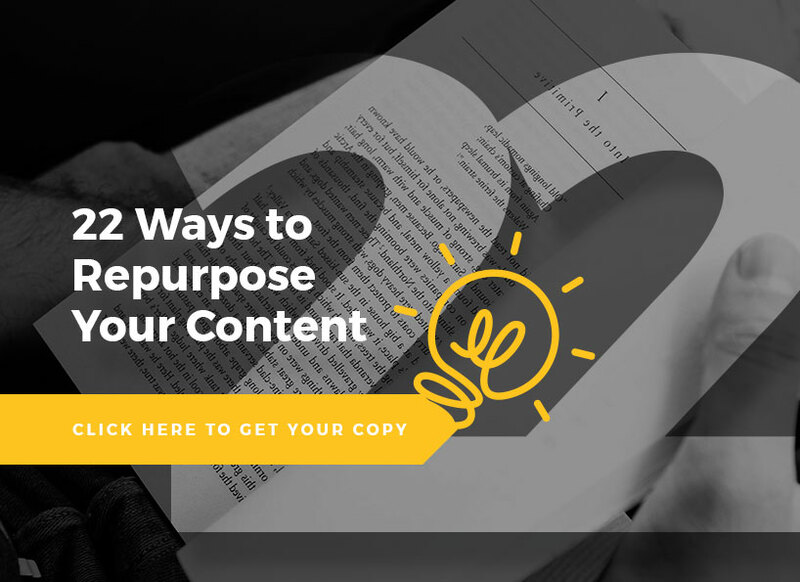 If you think you want even more ideas just click here and we will give you 22 Ways You can Repurpose Your Content. Create an animated video. This is such a fun way to reuse your content, and it’s captivating. People love those whiteboard animations, and video is powerful! There’s a reason why YouTube is the second largest search engine. Put it to use in your small business marketing! Design an infographic. People love to look at infographics. They are one of the most often shared pieces of content. That’s because they are an easy way to get information quickly. Plus is has the bonus of being highly visual, and that makes it appealing just just about everyone. Build a SlideShare. You can take any PowerPoint you’ve made and turn it into a SlideShare. It works similarly to a video, but people click to advance the slides. Users can comment and rate your SlideShare, so it’s also a great way to get feedback from your viewers. Since the website gets 70 million unique visitors a month, it can have a powerful impact on the level of exposure for your business. Host a webinar. If you’ve written an article, blog, or training material, you have points you can expand on to create a longer educational program. A webinar is the perfect place to host the program, and have the ability to interact with people from anywhere in the world. There are some easy to use and cost effective platforms that can help you host the webinar so you can become the go-to expert in your industry. Write a historical article or blog. Now here I’m not talking about a history paper like you used to do in school, instead take a look at what you’ve written since you started your business, and write on what you’ve learned on your journey. You are bound to have a lot of great information and learning lessons you can share with your clients and peers that might save them a lot of time and trouble. Plus it’s the perfect way to tell a story, and people love stories because they are so much more interesting than an educational text. So start thinking about ways you can get more mileage from the content you’ve already produced, so you can get more traffic coming to your small business website. And if you need a little more help, feel free to contact us. We’d be happy to chat with you.